Webster University community members and partners celebrated a historic occasion for the institution and for downtown St. Louis on Jan. 11 with the formal re-opening of the Arcade Building as home of Webster's Gateway Campus. Guests and visitors filled the 130-seat auditorium for opening remarks before taking tours of the space, which was redeveloped by Dominium Development in conjunction with the opening of the Arcade Apartments above. The Arcade opened for classes in the first week of January with the start of the spring term. The new space, across the street from Webster's existing space in the Old Post Office, will better serve Webster students as well those who live and work downtown. 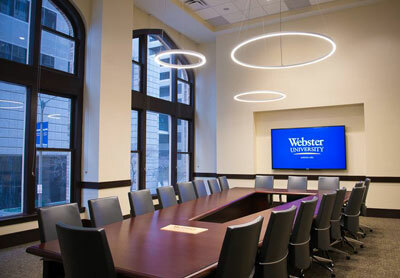 Webster will partner with the entrepreneurial community, add to downtown St. Louis vibrancy with leading-edge academic programs such as Cybersecurity, Criminology, Legal Studies and others, and provide space for major speakers, art exhibitions, lunch-time learning and community gatherings. spaces for Webster students, faculty and partners. "Today is the fulfillment and continuation of what is Webster's longstanding and unique commitment to downtown St. Louis," said Webster University President Elizabeth (Beth) J. Stroble. " It's important in any urban environment that citizens and workers have the opportunity to live, work, study and play in every respect while in the downtown community. Because Webster has a comprehensive presence downtown, we will be able to offer many programs and activities and be a full neighbor and partner with the community here. Stroble welcomed students, faculty and staff, community partners, and representatives from the mayor's office and other local universities. "Through this move we will bring more, and new, people and ideas to St. Louis," said Julian Z. Schuster, Webster's provost, senior vice president and chief operating officer. "The symbolism of this moment is that we are together bringing to life something that has been a landmark of this city and this community for decades. Watch video highlights from the opening and tours here, and see photos in this Facebook album. 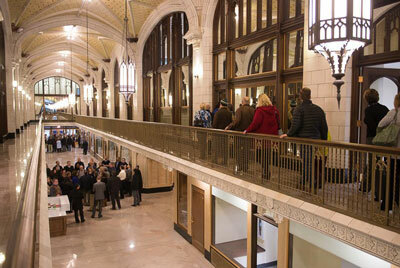 Guests tour the Arcade Building as home to Webster's Gateway Campus. Listed on the National Register of Historic Places, the Arcade Building was dormant for nearly three decades as different city leaders and developers sought a way to save it. Webster was a critical mover in bringing it back to life much like the adjacent Old Post Office building before it. 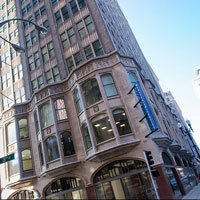 Webster University opened its first downtown St. Louis location in 1975 at Broadway and Locust Street. In 2004, the University relocated the downtown location to become the anchor tenant for the renovated Old Post Office. The redevelopment of Old Post Office Square (bordered by Olive Street on the south, Locust Street on the north, Eighth Street on the east and Ninth Street on the west) has long been recognized as critical to the vibrancy of downtown St. Louis. When the project began in 1997 there were 70 empty buildings in downtown St. Louis. The Old Post Office was the first building revitalized in the 20-year project. Today only one building in this district remains unoccupied.